The ToonsTV app provides users with over 30 video channels of family-friendly content, starring the Angry Birds, Wallace and Gromit and more. 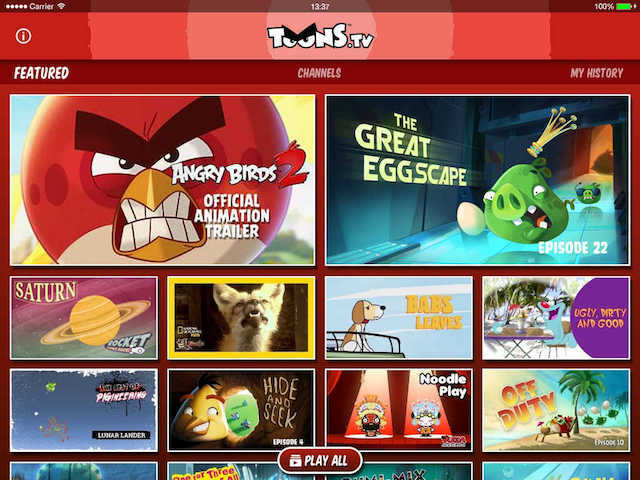 Rovio has launched its ToonsTV video platform as a standalone app on iOS and Android devices. Already accessible within Rovio’s mobile games, ToonsTV offers viewers access to short videos based on the company’s characters, like the Angry Birds, as well as third-party content. The ToonsTV app offers users over 30 channels of free, family-friendly, ad-supported video content, including channels for Rovio’s Angry Birds Toons, Piggy Tales and Stella, among others. In addition, users can watch a variety of third-party channels featuring Wallace and Gromit, Pucca, Qumi-Qumi and National Geographic’s Zooville, as examples. The app allows users to browse a featured list of content, or browse by channel, and provides users with a viewing history if they’d like to re-watch a particular video. While playing a video, users can toggle the ‘play all’ switch for continuous video play, or view recommended videos when their current selection ends. With more than 5 billion views globally just from within our mobile games, we felt it was time to create a single convenient app where fans of all ages can always find all their favorite Angry Birds series and other great family-friendly or educational shows. ToonsTV will be a must-have app for all family mobile devices. The ToonsTV app is available to download for free on the iTunes App Store and Google Play.